Been foraging today, and have plans for much yumminess tomorrow. Took the Wildman Steve Brill tour in Prospect Park today, and getting ready for Father’s Day dinner tomorrow. In addition to smoked beef ribs my partner will be preparing, I’ll be composing an herb and wild mustard greens salad. 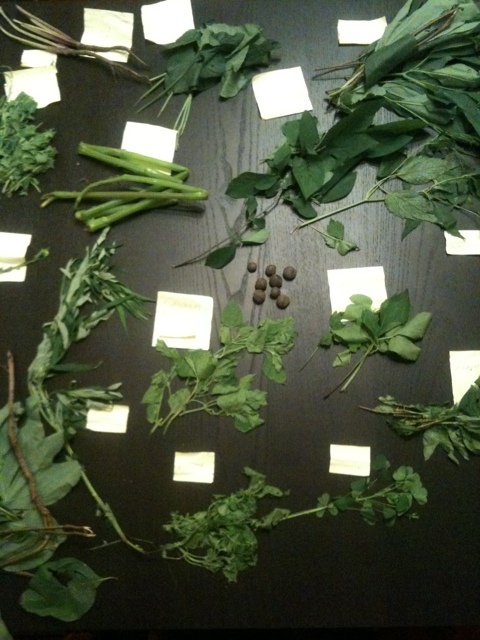 QUESTION: have you ever prepared a dish using wild edibles? Any favorites? Suggestions? What to dos? What nots? This is my first post here, so I took a look back to see some past topics. I took my first ‘Wildman’ tour yesterday as well. It was informative and next time I will be better prepared to collect and label the plants along the way. I managed to collect a few mustard and jewel weed seeds which I will try to germinate. I restarted gardening a few years back starting with containers and slowly reclaimed about a third of my back yard to plant. The rest is just doing it’s own thing for now. Most of what I’ve been able to use from the yard so far is herbs. Basil, mint, scallions/ bunching onions, sage, catnip, arugula, parsley, red clover, and oregano which is still too small to use. About all I’ve used them for is to add into salads. Small strawberries which survived outside through the winter go into salads which give a nice little burst of flavor in your mouth. Hey, thanks for posting that. There’s a lot of good information in here I’m planning on putting quickly to use. A couple follow up questions: how did you come to find out about catnip? I saw somewhere recently that humans may like it too but I never knew this. What does it taste like? How did you decide to use it? Do you have any cats that end up attracted to your garden? (I have a neighbor cat that likes to crawl through my herbs whenever my dog is on a doggy date or if she’s in the basement being lazy, and I’ve been wondering how to keep the feline away). Last question/comment: hope you don’t mind I find this useful enough I want to share with more folks — I’m making it my daily comment and inviting some feedback on the following …. QUESTION: what other ways does anyone know of to extend the usefulness of groceries purchased in a supermarket, greenmarket, CSA, or other? In other words, does anyone have more suggestions to add to Ralph’s excellent suggestions for getting the most of your scallions? What are some other ways to keep the grocery list, bill and god-awful end of the day visits short?